Barcelona’s talisman and football legend, Lionel Messi has been going under the needle to cover himself in ink for quite a while. 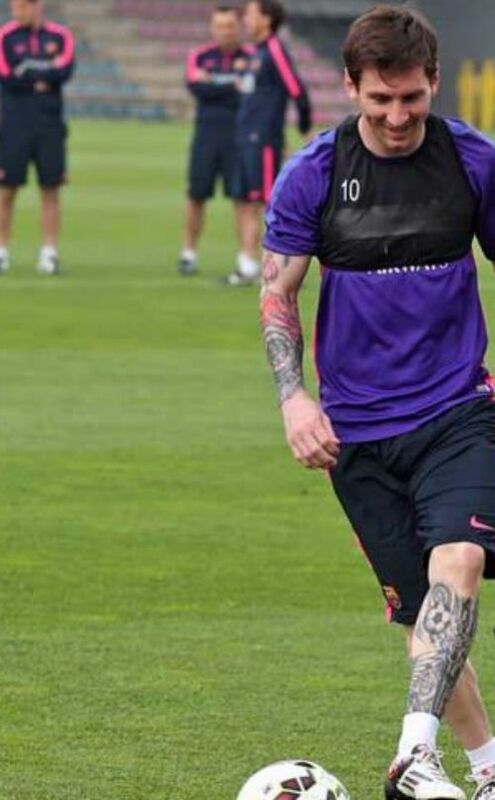 Messi took inspiration from his teammate Dani Alves who is known for his full body tats. Apparently Messi was initially afraid of the pain so got his girlfriend Antonella to get a tattoo first and later when he got his first tat there was no stopping. The star has now collected some pretty impressive ink on his back, arm, and leg. Each of his tattoos holds a personal significance for him. 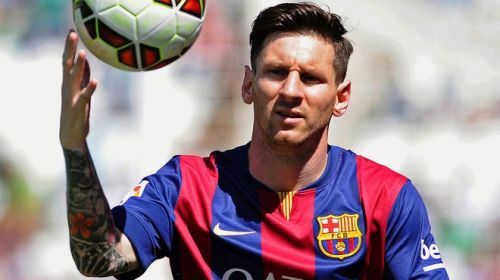 Let’s take a look at Lionel Messi’s tattoos and their meanings. Our favorite footballer sure is a mama’s boy. 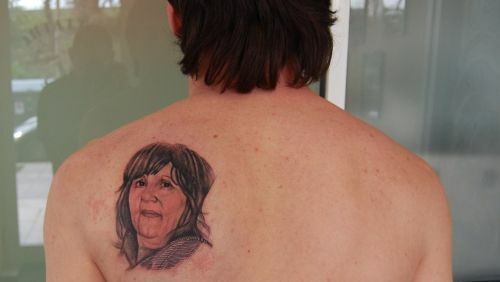 His very first tattoo was a portrait of his mother on his back. The tattoo is a tribute to the most important person in his life. When Messi became a father for the very first time on 2nd November 2012, he got the hand prints of his new born child tattooed on the calf of his left leg. 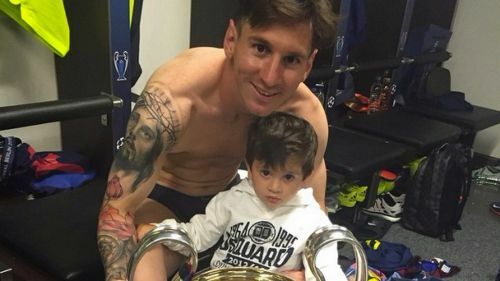 Messi went under the needle once again to show his fatherly love and affection for his son when he got his name “Thiago” inked on his leg. 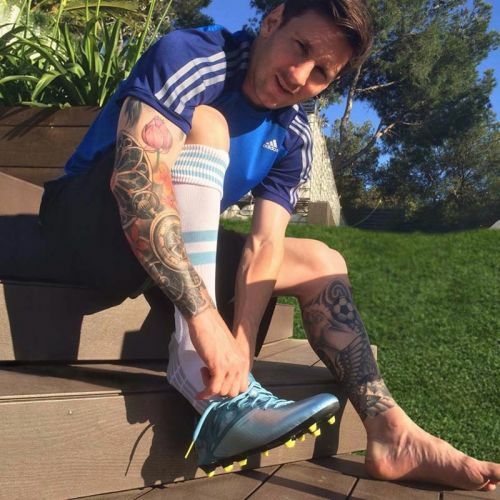 Lionel Messi dipped in ink once again to get his left leg covered with tattoos. Many cover up tats were added to beautify the already existing “Thiago” tat. Apart from this Messi decided to dedicate the remaining portion of his leg to his love for football. He added the no. 10 which is the no. of his jersey, he also added a sword and a football. The artwork of his left leg shows his passion and love for the game. A tattoo of Jesus’s face with a crown of thrones sits upon this football legends right arm. 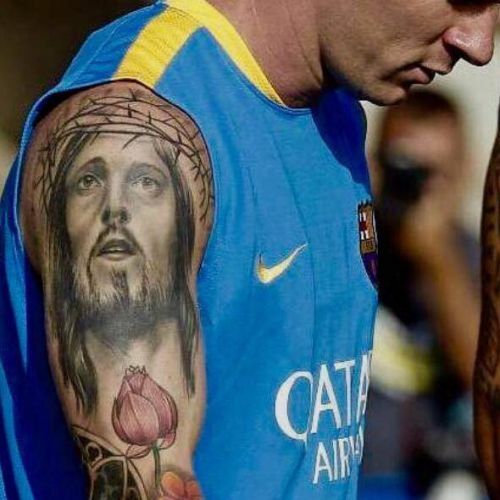 This tat declares Messi’s religious beliefs and pays homage to it too. We all know Messi hails from a small Argentina city Rosaria. He is a perfect example of from rags to riches story and his Lotus tat on his arm also explains this. 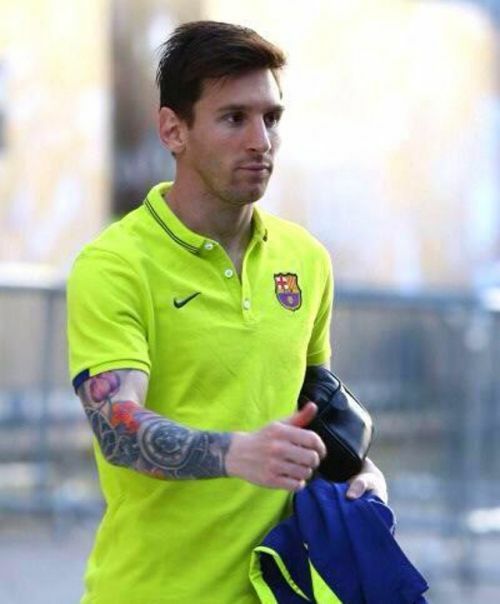 It is a part of Messi’s full sleeve tattoo and it symbolizes that talent can grow anywhere. A rose window inspired from the Sagrada Familia church in Barcelona is a prominent feature of this football star’s sleeve tattoo. All said and done one thing is sure, the way this football legend is getting inked we sure can hope to see a new tat really soon….